This article describes how to use Virtual Box functionality that is available in our commercial solution Enigma Protector and freeware Enigma Virtual Box. How to make application portable and hide files from users. This is a function that allows to merge files (and registry keys) into single protected/packed executable such way that application can still see these files (registry keys) but they won’t exist on the disk (registry). Protection emulates files (registry) calls in memory that helps to hide files (registry) from application user. Portable program is the program that does not require installation, does not usually require administrator privileges and does not keep files (registry keys) on the user computer while using. Quick and full program removal. To repeat, the main goal of Virtual Box feature is that you do not need to have files you embedded there on the disk, after protection. Do not distribute embedded files together with protected application, it does not need/use them at all. Incorrect location of virtual files in the tree. Many users think that if program is installed into Program Files folder, then the root folder in the files tree should also be Program Files. No, that’s wrong! This does not matter for program and for Virtual Box where the program is currently located and where it installs. What matters there is a location of embedded files relative to the main executable. For example: if a dll (which you would like to merge) is located in the same folder with main executable, then it should be added to %DEFAULT FOLDER% of files tree (%DEFAULT FOLDER% means the folder of main executable). If dll is located in the “data” subfolder of the folder with main executable, then in Virtual Box you have to add a root %DEFAULT FOLDER%, then add a subfolder “data” and then add a dll into that. 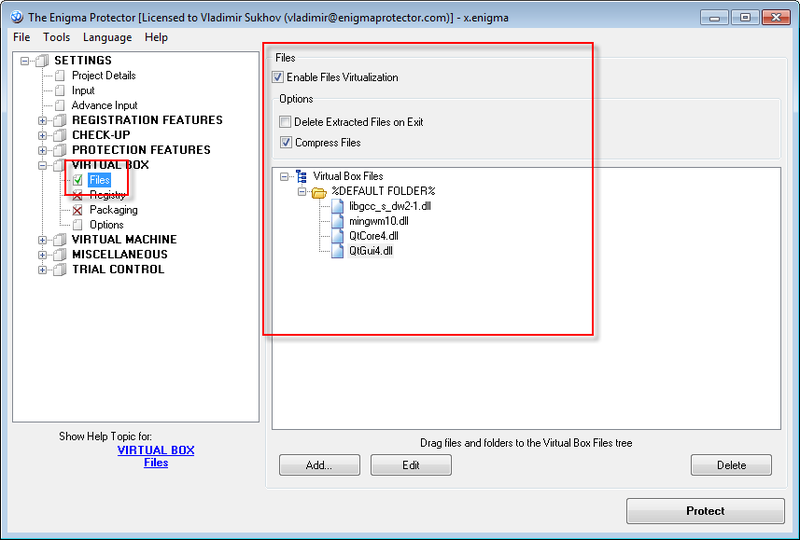 Another executable files can also be added to Virtual Box, it’s OK. But Virtual Box will be able to run the virtual exe file only if architectures of main executable and virtual are the same, i.e. both files are 32 bit or 64 bit executables. If main executable is 32 bit file, but virtual is 64 bit, then Virtual Box will be unable to start such virtual exe. Files protection, application calls to protected files are secured, to avoid being extracted and reused. 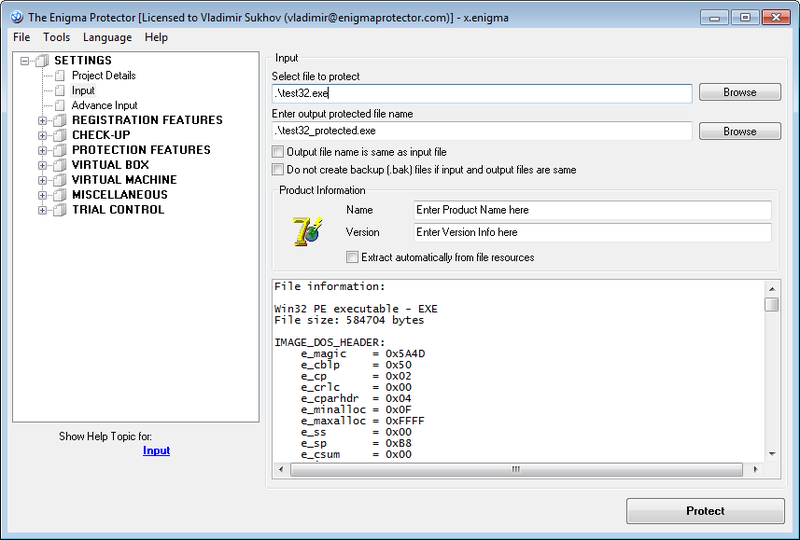 If you need even a basic protection for embedded files, we recommend to use Enigma Protector only.